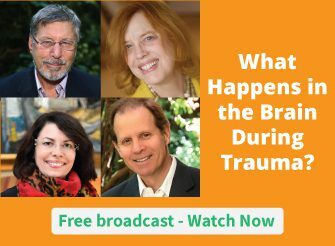 Trauma can change the brain . . .
. . . but the person who experienced the trauma may not be the only one whose brain changes. In the video below, Ruth Lanius, MD, PhD describes what we’re discovering about the connections between a parent’s trauma and their child’s developing brain. How have you seen trauma affect a person’s interaction with their child? Please leave a comment below. For information on how to help clients reclaim what’s been lost to trauma, please click here. I am a mother who suffered severe PTSD surrounding the circumstances of my own mother’s death when I was 10. To lose a parent young is bad enough but the way it happened….I have carried permanent scars since. My child is young and I got sick a year after he was born, causing a subconscious fear of history repeating itself. I recently realized I’ve been in a dissociated stated 75% of the time, and it took me 4 years to figure out why.. getting sick triggered me and I spend a lot of time alone with him. I have been subconsciously terrified I’m going to die while we are alone here. I’m sick, but I’m not dying. There is nothing wrong with me that will cause me to die suddenly abd cruelly like my mom did. Now I’m trying to figure out what to do with this because my child is the most important person to me in my life, I love him so much that it really actually hurts. My dissociative nature has to affect him, and I’m completely clueless as to how to cope with all of this. There is a huge part of me trapped at age 10. I don’t know how to heal myself to a point where I can be more present and the guilt and shame I feel is immense. There really needs to be seriously focused therapy for people like me that actually works because it’s not about me anymore, it’s about him. This video talks about adults who have suffered childhood trauma and how it affects them later in life when they have a child. My wife was inflicted with if you brutal traumas later in life, while she had a two-year-old child, she was severely beaten scared for her life went into hiding and at the same time was involved in a drunk car accident, she was not drunk, she was hit by a drunk driver that almost took her and her child’s life and caused her entire like to have to be rebuilt with steel and was told she would not walk again. She is walking again, and she had another child. I’m wondering if there’s any research or help for this situation. She is extremely controlling and very overprotective in my opinion and will not admit it whatsoever. The child who was 2 at the time of these traumas is now well adapted and in college. Her other child is a teenager and I definitely see it affecting him. Looking for suggestions advice and help. Thank you! Yes, I’ve seen it; my mother, who died in 1991, crushed me psychologically and also almost strangled me to death when I was 7. I thought I was dying. She died age 67 and two years before that shared with how she had had traumatic and abusive experiences herself around the age 11 to 13. She said it was the first time she had spoken about them. I’m almost 67 myself now and am fortunately working through the horrors I went through. I grew up w/ a mother that was abused as a child & therefor had trouble attaching to my needs. I also had a father who was abused by the church when he was an aged boy- so that affected his maturity as well. My 2 (7 yrs old than me & identical twins) brothers were extremely abusive to me as well. I’d like to know where I might go to uncover what state my brain is in, in terms of processing emotions etc, I do feel I’m at a disadvantage to my peers when it comes to processing things like: social events, deep connections & many other situations. I have seen patients total disengage from their children and enter a cycle of addiction, homelessness, and mental health crises that lead to intermittent psychiatric hospitalizations and more permanent dysfunction as time progresses. Yes, I have experienced with with my mother, how she reacts and responds to things is heightened and how she is affected me. I feel she has a difficulty regulating her emotions and being close physically and emotionally and trusting a bond and relying on it. Her tendency is to control in relationships and need to be in charge. I feel she as well as trauma did not have probably a secure attachment with a parent and this was passed down to me and I have needed to heal, learn and grow in many ways. I ‘ ve seen three generation of women hurting each other due to their circumstances. The adolescent that I was trying too help was developing a behavior and used drug during parties after work. Her mother decided to cut off the disruptive relationship. My client did not get along with her step father. Recently she became pregnant. Without any skills she is unable to care for her baby daughter. I was surprised by how fast trauma can spread in such a relative short time. How does a parents childhood trauma affect how they parent their adopted child who also comes to you with developmental trauma? How does a teachers childhood trauma effect how the teacher responds to a child in their classroom who has been impacted by developmental trauma? When a child comes to you who was in toxic stress, profound neglect, for the first 3 years of development what lens are looking through? These are all questions professionals need to ask when staring the journey in wanting to help this child. Perhaps you, the adult needs to heal first. Re-traumatization looks like many of the disorders in the DSM. Can we as adults ask the hard questions? Are we helping this child or are we sending them on a path of mental illness? I was aware that I wasn’t able to connect with my children the way I wanted to, that I was at an emotional remove much of the time. Motherhood was difficult. Additional to my own trauma burden was the sheer number of hours per day necessary to keep the family fed and clothed and washed and supervised, on top of too little sleep nearly every day, was a dangerous combination to my physical and emotional health. I was happy that I did keep them fed and clothed, and that I wasn’t a drug addict as my mother had been, that I hadn’t neglected to feed them, and was good about giving them books and clothes, and some wide variety of experiences. Trauma is generational, and I did achieve improvement over my mother’s parenting of me, in which I had been taking care of her and taking care of my younger brother and sister. I’m not a narcissist, either, thank God, and rather than imitating my mother’s demanding and high-volume, anxious self-centeredness, I erred to the other side of the spectrum.So glad to know that many therapies exist now to help people regain their joy in life, and glad I’ve taken advantage of some. I hope my children someday improve themselves with good, brain-based modalities. It feels good to let the pain go…. I see mother’s responding with hypervigilance or overraction to mildly distressing situations or shutting down amd giving little to no response when one is warranted. Also, in my experience of practice they often have issues with transferance and projecting their childhood experiences on to the unrelated experiences of their children. I have noticed a child who didn’t receive much love and attention from his / her mother do not tend to form relationship easily. I am in my 40’s and kind of isolated from everyone. just can’t get along. It has always been hard for me to stick to a one group, like family. Always disliked being seen. But gets better with practice. In many ways it is no doubt any kind of external support like this one is really appreciated because if it’s richness. Thank you again. Hi Ruth, thank you for setting this blog. It is the most interesting I have participated to. I really enjoy the sharing. As a parent who suffered deeply traumatic experiences between child number two and child number three, I can say that I was a very, very different mother to child number three, alternating between checked out and dissociated to extremely anxious and bypervigilant. My eleven-year-old daughter bears those scars. While I am biologically, cognitively nor psychologically the same person as before, with intensive treatment I am improved. I don’t need the neuroscience to validate the effects of trauma on my child to know its impact, but the evidence is deeply validating. Yes, I have seen parental childhood developmental trauma affect our grandchildren, the lives of my AL-Anon friends, and personally because I experienced chronic, violent trauma at the hands of several abusers in my family of origin. My practice is with the 12-Step program of AL-Anon for families and friends of alcoholics; I have been a faithful member in recovery for more three decades as I have lived my own life successfully “on the outside,” yet having amnesia over most of my childhood. When I began the Somatic Experiencing training in December 2014 after an EF 4 Tornado destroyed our home and our daughter’s home on November 17, 2013, I have found a new pathway of service to help other trauma survivors heal, grow, and thrive through post-trauma growth. I graduated in September of 2017 in San Diego, CA as a Somatic Experiencing Practitioner, and I have finished one four-day module of the Integral Somatic Psychology 12-day certificate program. Two of our daughters are currently in the process of divorce after living with childhood trauma survivor husbands for twenty years trying to make their marriages work. There was no way because our two sons-in-law have no self awareness of their trauma and became both victims and abusers. There are five granddaughters that we are having to watch suffer now in a new way. I feel like their pain is my pain, and I am using all of my SE and AL-Anon tools to detach and to live my own life without the suffering that I am currently feeling for them. I have spent my whole life working to heal, grow, thrive and serve others. This is a particularly difficult challenge in our family right now. I am up for the challenge because of all of “the work” – reading, therapy, research, writing, crying, rising, psycho-education, and AL-Anon’s spiritual 12-step program. All of my tools help me to live each day with a sense of joy, happiness and freedom. I am currently checking into PhD programs, a goal I have had for twenty years. The closest fit so far is the Psychology and Health PhD program at Walden University. Thanks to all of you are working on post-trauma growth in the service of others as I am doing. My childhood trauma – physical abuse and family dysfunction played havoc in my marriage with my wife and children. At year 7 everything started coming apart. My wife said I either go for help or … And my son was becoming like me – something I didn’t want as I didn’t like the person I was and I didn’t want him to become like me. So I began a long road of personal counseling and healing which overall took 10 long years off and on with various counselors. After a number of significant breakthroughs with a trusted friend and gifted counselor I came to a significant measure of wholeness which has permeated my marriage and the lives of my children. While I can’t change the past, sitting down individually with each of my adult children, apologizing in depth and making amends where needed as they shared the pain of their experience of me as a father, this has had profoundly positive impact on them and me. Now my wife and I lead an inner healing course called Freedom Session http://freedomsession.com/ which has helped untold numbers of people to receive the needed healing much faster and in a much more systematic manner than anything I had experienced on my healing journey. It’s never too late to go for help and never too late to try to address the past both for your personal benefit and that of others, especially those closest to us. I should mention that the Freedom Session course is neither short nor easy but intense and long (30 weeks in total) but well worth the effort. It is presently primarily in Canada but now migrating into the United States. I do hope it gets needed public attention and acceptance as it is such an excellent course which we have facilitated for the past 5 years with a recent excellent update. Do you have to be Christian to participate? I have a belief in God but don’t consider myself Christian. Thank you for sharing this. Truly fascinating and very confirming of what I have observed – where can we read more about this research on the ‘idling circuit’? I wonder how a 18 month old toddler will develop now that his mum – my niece – was a victim in a recent Terror Attack in Stockholm. When he hears the doorbell he runs to the door, when mum doesn’t appear he opens cupboards and drawers and tries to find her. His grandparents help out with care so that his daddy can go to work, but there is an emptiness in the gaze of the grandparents/ parent even if they smile to him, play with him. This inflicted trauma spread over the whole family, everybody was affected and still is today…….how do you engage with this particular type of trauma so that live can resume and yet have purpose, meaning and fullness. Does this type of trauma affect the brain in the same way as neglect, abuse, illness? What helped me the most and the most quickly was EMDR, followed by DNRS. For the little one, lots of fun, and some neuro-feedback in the form of professionally programmed video games that reward calm brainwaves would help. Also, talking about the trauma would help, even with a toddler. Just because the child’s not speaking in complete sentences doesn’t mean there’s a lack of understanding of the language. I think it’s better to say, “I’ve been very sad, and I’m sorry I’m so sad around you, because I love you. I will get better, and things will be happier one day.” Then it’s up to parent and grand-parents to follow through and GET better and be happier. I heard the talk, and it is indeed relevant. Thank you for sharing these important notes. Our daughter-in-law was sexually abused by her father as a child. Her relationship with their daughter has been fairly hands off, as far as I have observed. Our son carried and cared for their infant all the time. He is home with PTSD from deployment in Iraq, but was not traumatized as a child. He is our 5th child, born after the sudden death of our 18 mo 4th child. So, I was traumatized as a parent for him. But I was a stay-at-home mom and was there physically for all my children. My emotional involvement was different for each child, naturally. Trauma is a result of living on this planet. With respect to how my mother handled herself after my initial trauma–I think she felt very remorseful and tried to make up for it–but ONLY after she realized I was quite far from intellectually- delayed. What the doctors told her was simply not true…they were hiding the part they played in my birth injury. With complex trauma, *arrested development* I am sure happens in PARTS of the brain, but in saying this- simultaneously, other parts continue to grow and do develop before during and after trauma release. There were two areas (at least) which have been problem-children for me….the amygdala, in the challenge of somatic recapitulations, BEFORE the many effective release modalities, in my case, ending in SE and Homeopathic meds. One exception to these experiences being fully processed is this bizarre *feeling like a baby* which happens seldom now because I am not required to be particularly mature or public–but rather relaxed, day to day. The baby thing is debilitatingly sudden and vulnerable when it occurs…all confidence falls off a cliff and I recognize other adults have authority, but I do not. Being short and small does not help either. I makes me speechless and afterwards, humiliated. I may have just said something brilliant and eye-opening and suddenly feel smaller and less important than a grain of sand. Smack- and I probably leave my body, dissociate. The second *place* which is clearly problematic is the hippocampus. This is very difficult and deeply frustrating to explain to those who have a fully functional hippocampus. Brain injury is worse than injury that you can see…people cannot relate to it. From my reading, I get that the hippocampus holds images and holds feelings of images in the mind. This function is bigger and better than most people understand. To manifest good things (winning in life)…we must first be able to see and feel these actions, accomplishments, acquisitions. How you *manifest what you want* is by holding that desire and image in your brain…you know…we draw into our lives what we hold in our feelings/thoughts, right? A runner doing hurdles sees herself clearing each hurdle before she does it physically. This manifestation function is missing in me–I close my eyes and try to think of a steaming delicious bowl of lasagna, and what do I get? BLANK FLAT COLOR. In guided meditations—big ZERO. NADA. NOTHING. My brain is the dreaded AUDITORY-DIGITAL (is that also what autism is?). So, concerning brain trauma, it made me debilitated, unable to manifest positive things and kept me chemically repeating ACTH, the negative memories somatically….pain, paranoia, anxiety, heart palpation, sense of rejection, until that was released. But now that the release is done, I still cannot visualize, even though I’m an artist! I would call that developmentally arrested in a very different way. Thank you Elaine for articulating so much of my own experience with C-PTSD, knowing this info on which parts of the brain process feelings, body sensations & executive functions that we are learning from neuroscience is really liberating to me! It helps me to release a lot of the SHAME of having an inferior personality, or ego. Thank you NICABM for sharing the wisdom from leaders in this field. As a survival of childhood trauma and raising my children; I must say I experienced detachment. I wanted to touch my son, the touch a mother should be able to do. But I was afraid to hurt him. I believed I loved my eldest so much that I kept myself away from him for about two months of his life. Once I realized I could not hurt him, I showered him with the love he rightfully deservered. Thank you for this video as it allowed for reflection. Difficult to listen too. The narrator seems to be reciting from memory with cue cards. “chronic childhood trauma” doesn’t make sense, childhood doesn’t re-occur. I think the more accurate terminology would be chronic developmental trauma, or C-PTSD. Parents I’ve observed may be too reactive and less able to sit back and assess what the child needs fostering a miss match between parent and child. This is wonderful! Thank you so much for sharing light on this issue. I suffered for years diagnosed with PTSD. I knew something was wrong with me but I didn’t know what it was until I was able to put my soul on paper as an author who speaks for those suffering PTSD, domestic violence aftermath, sexual abuse especially molestation. One of the main points I make is a person can only give you what he or she has. If you have been damaged by trauma, you will eventually come up short somewhere simply because of the need to survive. I really appreciate the comments on this page. We all need to communicate our journey to strengthen and encourage one another. I knew I was damaged merchandise early in life and when I had my children, so much of myself was shut down, I worked it daily within myself to not give them the worst aspects of myself but to push the better part of myself to the surface because I knew their development depended on it. In the end, I lacked for myself but they were well provided with what they needed to be amazing people. I had a traumatic brain injury aged 28. I was told I could work & I gave it my best shot, because I loved my job & wanted my life back. My husband & I started trying for a baby when I was 30. After 2 years of trying without success, we realized that I my menstrual cycle had completely stopped. We saw a fertility specialist who said that I was too stressed for my brain to tell my ovaries to release eggs. After a series of injections I became pregnant with twins which we were so happy about. Sadly I got listeriosis & the babies arrived at 28 weeks. The first survived only 6 hours, but the second is now 12 & doing well. However, I feel that the bond we initially had has been altered/removed & she is much closer to her dad. She grew up with a mum that was a depressive insomniac suffering neuro fatigue, who wasn’t allowed to stop work as my TBI was not recognized. I think we both suffered immensely from the lack of comprehension of TBI. I wasn’t able to stop work until an epileptic seizure in 2015, 15 years after the accident which caused my trauma. My daughter now has a phobia of blood & injury. She & I are seeing a psychotherapist to try to deal with it all. I would love our bond to be restored. I was a child and early adult when I had severe trauma. One of the symptoms when I had my children was the lack of oxitocin for let down response for breast feeding. I had great difficulty with breast feeding both of my children, and it compounded my stress around breast feeding. As an adult child of Holocaust survivors, I didn’t realize how their experiences affected me until much later. My parents were caring and loving but we are a very “enmeshed” family. I carry a lot of guilt and anxiety. My problems were minimized and mostly it was difficult to differentiate. I didn’t realize how much anger and anxiety this caused, but there’s no doubt that my mother who had me when she was 23, just 7 yrs after losing her entire family, was carrying sadness and anxiety. my parents are so resilient that it was hard to see. But I guess I got some of that too. I’m happy there are so many comments and people who have shared this blog/video. I admire the work of Dr. Ruth Lanius and recent developments showing how promising neurofeedback might be for those of us with developmental trauma who are parents and advocates. Over at Parenting with ACEs (Adverse Childhood Experiences) we have a group where we hope parents with ACEs and professionals who work with us (and many of us are both) can work together to strategize real and helpful supports. For those who find a video like this speaks about us, more than to us, it might be helpful to work together as peers, professionals and in community together. The hope is that working together outside of clinical practice helps us learn more from more diverse groups of people to learn what is and isn’t most beneficial, helpful and healing and what those of us with children and who are breaking the cycle find most challenging and helpful. We have a monthly chat series and rotate parents speaking and professionals sharing. It’s free for anyone wanting more insight to what parents experience, want and need. Chat guests next month are Parenting with PTSD anthology editors Dawn Daum and Joyelle Brandt. I look forward to more here on this topic from varied perspectives. It certainly a topic deserving of far more attention given what we know about the lifelong and long-term impact of ACEs and the power parents have to shift and change things for generations and generations. I have had the opportunity to experience this issue from both sides of the question. My mother displayed significant trauma issues herself (including dissociation) and my father was at worst, a sociopath, so there was endless trauma from infancy on. Attachment was simply a word, not an event. Sadly, I had no concrete memory of my childhood until my parents died when my children were 10 and 11. Over my 30-plus years of recovery, I have explored the ramifications to my two children, who are now parents themselves and trauma issues are an ongoing discussion. When I became a parent, I was dissociative, with chronic depression and anxiety. My attachment to my first-born son was never secure and further complicated as he got older by my automatic negative reactions to males. Because of my own trauma, I kept everyone at an emotional distance, including myself. Today my son is a loving dad who is very involved in positive ways with his two sons. But he is emotionally explosive, very much a perfectionist, suspicious of others, highly intelligent and very, very funny. My daughter was lucky enough to experience far more of my recovery and has been more open to frank discussions of trauma and its impact. So my attachment to her was more secure – but still not the best. Yet she has evolved as a wonderful, loving mother of two girls. She has an ongoing struggle with depression which she manages well and both my kids admit to having little memory of their past, or else significant issues with memory storage and later access. Both my adult children are very successful, in good relationships – but more importantly, they are very close to their own children and light years ahead of my parenting skills. I am wildly grateful to see the openness of my grandchildren, the lack of fear, the great eye contact, their ability to touch freely and hug without shame, and how easily they turn to their parents for love, assistance and comfort. None of that was present in my own childhood. When I committed to recovering from my childhood so many years ago, my sustaining motivation was to end the family pattern of abuse with my own generation so my grandchildren and great grandchildren would never know what it felt like to be unloved and abused. It is amazing how we continue to evolve as a family. I have worked with families and children for over 30 years, so I am very sensitive to parent/child interactions, lack of connection, trauma and attachment issues, etc. That’s another complete discussion. But most often I see an inability for parents to connect to their child’s internal emotional experience. And as truly hurt children themselves rather than as complete adults, it often becomes a demand by them for their children to meet the parents’ needs. With harshness and an inability to relate to emotions of the child. Very little soft kindness, very little affection. Sternness. I did not have a child because I treated my inner child the same way and felt I would be harsh towards my own children. Sad story. Please check out the National Conference on Integrating Yoga into Mental Health Care in Dallas, PA June 30-July 1st. I will be giving a presentation on working with clients in a dissociative state, which will include information on trauma and the brain and how to work with trauma survivors. I guess I was one of those babies…my mom was traumatized by being in the Marines at age 16. (She forged her parents’ signature) She was mentally discharged because she broke down after playing the accordion for young boys with no arms and no legs. She became an alcoholic later and by the time she had me, I would say she was suffering from PTSD and borderline personality disorder. (She was verbally and emotionally abusive). In those days, no one went to a Mental Health specialist or a psychiatrist. Very sad. I forgave her and wrote her a ‘no send’ letter after she died. I raised my son with lots and lots of love and hardly used the word ‘No’. (Only when it came to safety issues.) He’s a great kid and hopefully I broke the chain of abuse. I think trauma affects parenting in part due to the unmet needs during the parent’s childhood. If a person did not get their needs met as in abuse or neglect then they can be triggered by another being i.e. their child, needing something from them. The infant’s crying can trigger anger or dissociative symptoms in the traumatized parent. This important information adds to the growing understanding that little can be as important as supporting pregnant and new parents in order to reduce the stress and trauma they carry into the environment their children develop in. Support and therapy for those becoming parents is like preparing the earth for new plants. If you are not familiar with the research in this field, you can learn more at http://www.birthpsychology.com, the website of APPPAH, the Association for Pre- and Perinatal Psychology and Health. this all seems of minimal value. I don’t see how this helps the ongoing victims of abuse. Yes, it is important to understand more about the full range of effects of trauma, but I cannot help to think that it is much more important to focus on prevention… That is where our scientific, and sociological effort should be focused. I was abused physically and emotionally neglected. As I got healthier from therapy etc I was and am a better mother. there is no point in saying much of anything until a way is devised to separate the … oh how do they say, the wheat from the chaff, the frauds from the real Sybil’s of the world, the raped, the abused and neglected of the world from the spoiled rotten melodramatics. I keep thinking the neurons themselves must leave behind some kind of evidence besides of course to the hiring surviving victims of atrocious acts committed against their bodies and minds. I have been in and out of therapy and I doubt any of the doctors believed for a single moment that I was actually from Germany and Long island originally or had ever suffered any neglect worse than being told I could not have any candy or any worse abuse than being smacked on the shoulder and scorned at for coming home late from playing. And how kind of my stepfather to go through such trouble to make it look just this way. I see it all now retrospectively. I meant to say, surviving victims of atrocious acts…. in the above statement and also need to clarify that where I came, where my mother came from, had nothing to do with what was done to my mother and me however it nevertheless made us much more vulnerable and easy pickings and apparently I was a very pretty little one he could barely resist and yet resented. Too late now to catch him. He died of an apparent heart attack just this past October 31st 2016. I just hope I was wrong about his appetites and pleasures besides his very public one of being a pillar of the community and just an all around nice guy and regular joe schmoe working class hero type. It would be tremendously helpful, and in fact ethical, to be more specific regarding the types of (parents’) trauma you’re speaking of in this video. Also, severity, lack of treatment or extent of treatment (for parents with trauma) who participated in the studies that are referred to here. This is tender terrain for parents who already rightly feel tapped and taxed. As a therapist, of over 25 years, working with personality disordered folks, many of whom are parenting, clarity of facts and statements and empirical steps are essential.